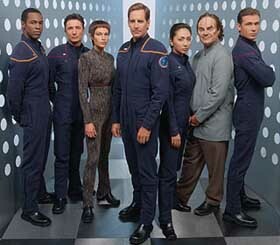 Enterprise - there is no Star Trek in the title - is about to warp onto our screens. But what's it all about, and Anthony Clark asks more importantly, will it be any good? Set in 2151, 150 years from now and 100 years or so before James Kirk, Enterprise is set in the pioneering days of interstellar exploration. The crew of Enterprise exhibits a sense of wide-eyed wonder at the strange things they encounter. The show also explores the intergalactic upheavals that eventually led to the formation of the Federation. 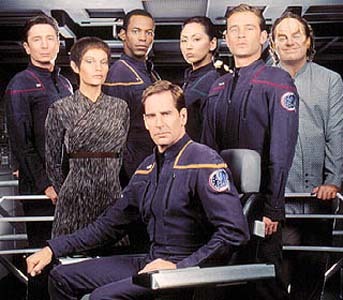 Moreover, Enterprise is the first Star Trek series to feature an ongoing plot line from the beginning. In the pilot episode, Broken Bow, a mysterious alien from the future is introduced. In partnership with the genetically-manipulative Suliban, this unknown figure is set to recur throughout the series. Broken Bow Plot Synopsis: A Klingon, carrying vital information to his homeworld regarding the shape-shifting Sulibans, is shot down over Oklahoma and pursued through cornfields by Suliban agents. The Klingon manages to kill his pursuers but gets shot by a farmer. While transporting the delirious Klingon home, Starfleet captain Jonathan Archer encounters more Suliban, who invade his ship and kidnap the Klingon. As Archer and and his crew search for their lost Klingon, Archer learns from a Suliban dissident that the Sulibans are trying to instigate a Klingon civil war at the bequest of the enigmatic man from the future. In return, the mystery alien is teaching the Suliban how to enhance their DNA and give themselves superpowers. Meanwhile, T'Pol, the Vulcan science attaché assigned to the mission, thinks Archer should have returned to Earth the minute the Klingon was captured. Armaments: The Enterprise is equipped with laser cannons, hull-retracting plasma-charged artillery turrets and spatial torpedoes. Defensive mechanisms: No shields, only equipped with retractable polarized hull plating. Shuttlepods: The Enterprise is equipped with shuttlepods, each carrying six passengers and a pilot. They are launched using a magnetic arm, which lowers them through bomb bay doors below the hull of the ship and then releases them. Used for ship to shore, ship to ship and ship to station transportation. Capable of sub-warp speeds only. Replicators: The Enterprise stocks regular foodstuffs but has primitive replicators, or protein resequencers, that can produce limits items like pasta or beverages. Transporters: No bio-filters. Crewmembers must decontaminate themselves in a Decon Chamber with phosphorescent gel. Transporters are only used for cargo, though human transport will be pioneered during the first season. Communications: Long-range communications only possible while at warp. Intra-ship communications through touch-panel only. Away teams will carry communicators with primitive universal translators in them. Archer is a San Francisco native, is the son of one of Zefram Cochrane's chief warp-drive collaborators. He is a reasonable but headstrong Kirk-like figure who resents the Vulcans because he believes they impeded his father's work by not sharing more of their science. T'Pol is a young, all-business science attaché with the Vulcan consulate. She is assigned to the mission as science officer, but when Archer is badly injured midway through the mission, she asserts that her rank in the Vulcan military is higher than the Starfleet ranks of anyone else on board, so she also serves as the ship's de facto first officer. Like Dr Phlox, she's at first only supposed to be assigned to the ship during its eight-day mission to the Klingon homeworld and back. The chief engineer, fills the McCoy role as captain's friend and confident. Like Bones, he's a southerner who provides a lot of pointed wisecracks. Like fellow engineer Montgomery Scott, Charlie also seems to be third-in-command after Archer and T'Pol. Sato is the communications officer. Not only is she in civilian life a linguistics professor with an ear for alien languages, she also seems to demonstrate in the pilot some kind of super-hearing that even T'Pol comes to respect. Reed is the ship's armory officer. We don't find out too much about him in the pilot, but toward the end he provides Archer and Tucker with weapons they've never seen before, Phase Pistols: "They have two settings, stun and kill. Best not to confuse them." Mayweather is the ship's helmsman, who was raised on much slower interstellar cargo ships. Phlox is an alien doctor delighted with the opportunity to make an extended examination of human physiology. He also likes Chinese food.